I know it's past Easter but I really did make this card before Easter. I always forget about the monthly Waltzingmouse Blog Party and so I made this card a couple of weeks ago and have been impatiently waiting to join the party. The theme for this month is "New Beginnings" so I chose to go with an Easter/spring card. I was playing with my new Nordic Spring stamps and made this card in literally minutes. That's what I really love about Waltzingmouse stamps. They are really fun to play with! And everything you stamp with them looks great! Be sure to check out all the other amazing projects.in the April Waltzingmouse Blog Party! Couldn't be more perfect, Linda! Love the little tulip garden with that sentiment! The colors just pop against the white background! 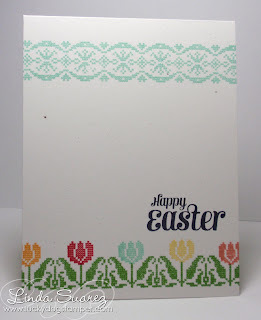 Your Easter card is just perfect for the blog hop! So pretty and bright also. Looks like a great stamp set. I am slowly building my Waltzingmouse stamp collection. I agree. Couldn't be more perfect. Sweet, simple and to the point. What a lovely card, Linda!! 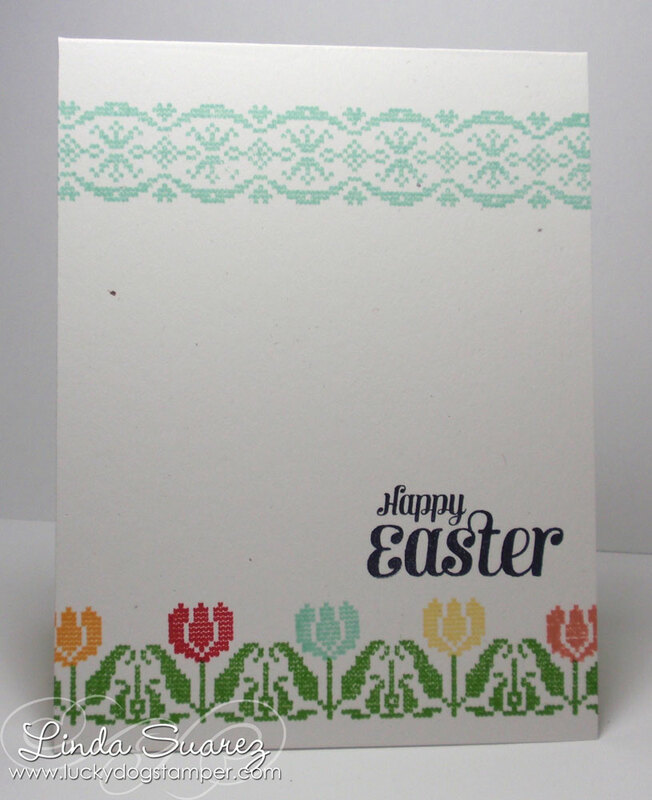 I love your Easter card, such pretty colours and your perfect stamping!! What a lovely CAS design! Your garden is SO colorful! What a fabulous one layer card!! I love the border along the top, and your nordic tulips are beautiful!! Linda, you couldn't have chosen a better card for a new beginning theme. I love how you used the Nordic Spring set, the colors are so bright and cheery. Love your sweet card! It really is perfect for the theme. I think Nordic Spring is such a lovely set and you have shown off the tulips so well with a mix of colors! This is so lovelyly, the stamped spring garden looks so fresh and pretty! This is really adorable, Linda. Great spring colors and you ROCKED this one layer card. Glad you could "party" along with us for this Blog event! I love your multicoloured tulips - perfectly stamped! What a wonderful card. That nordic spring set is really beautiful, and your color choices are just perfect. Now you've done it! I simply MUST have that stamp set. Love what you did with it. Very pretty, love the colour combos! Fabulous card! I love that row of spring flowers across the bottom of your card, so sweet. And Claire does make it easy for us all to look good using her sets doesn't she? This is a gem, I LOVE the different coloured Tulips, lovely card Linda, Thank you so much for playing along with us at WMS!! What a sweet, Clean And Simple card! And I so agree with you about Claire's WMS stamps, you can get easy but great results and have a lot of fun with them. love your use of nordic spring -- wonderful card! Fabulous CAS card. I love the nordic spring set and you really showcased it here!